Two different techniques based on metamaterials for mitigating both the differential and common-mode propagation in differential signaling are addressed. The proposed filters are implemented by means of complementary split ring and spiral resonators applied to coupled parallel microstrip lines. Frequency response, signal integrity and radiation emission are analyzed. Two different techniques based on metamaterials for mitigating both the differential and common-mode propagation in differential signaling are addressed. The proposed filters are implemented by means of complementary split ring and spiral resonators applied to coupled parallel microstrip lines. Frequency response, signal integrity and radiation emission are analyzed. 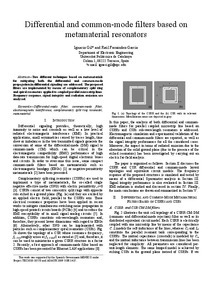 Gil, I.; Fernandez, R. Differential and common-mode filters based on metamaterial resonators. A: International Symposium on Electromagnetic Compatibility. "Proceedings of the International Symposium on EMC 2013". Brugge: 2013, p. 1018-1021. Differential-mode filter; common-mode filter, complementary split ring resonator, electromagnetic interference, metamaterial.